The Candy Basket quilt block is similar to many of the Basket type of blocks, in that it is generally shown on point and so it also allows for interesting quilts, simply by rotating any number of the blocks. 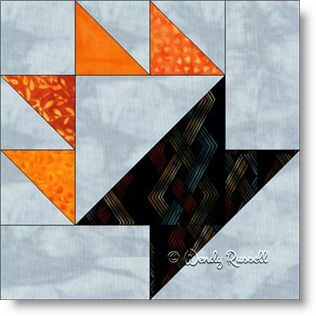 This quilt block is a wonderful choice for a beginner quilter because it uses simple shapes and not a whole lot of patches. The only "complicated" patch used is the half square triangle unit, which is the most commonly used patch after the square, in making a quilt. The sample quilts illustrated show a number of quilt blocks rotated to achieve a secondary pattern. (Can you see the stars emerging?) This quilt would also look great if you used a variety of different coloured fabric for the "candies" in the baskets.